My cautious approach to Rajesh Roshan continues... Truth be told I wasn't expecting a lot from this two-fer, and truth be told it's mostly average. Mostly. On the 'Swayamvar' [review]  side it's only 'Mujhe Chu Rahi Hain Teri Garm Sansen' that does anything for me; pretty, verging on saccharine but undeniably likeable. And the instrumental interludes are quite lovely. 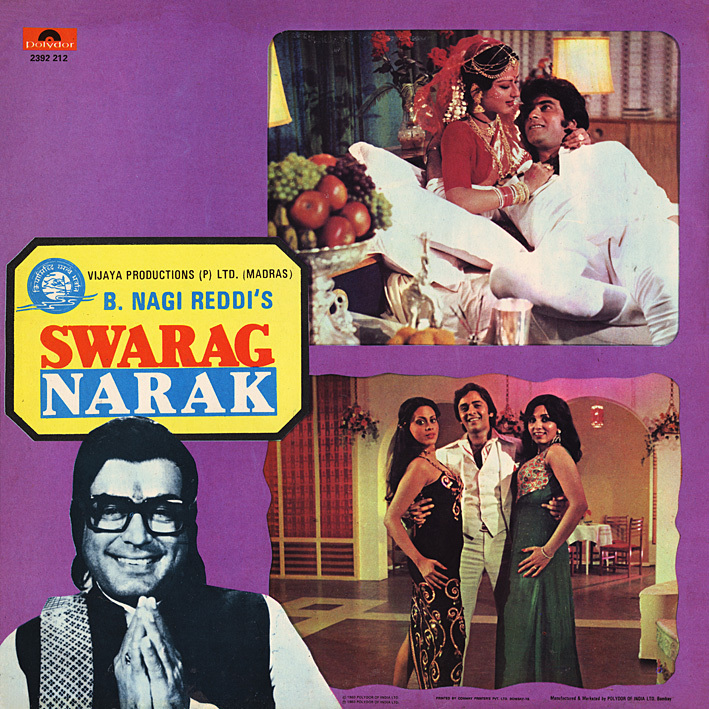 'Nahi Nahi Koi Tumsa Haseen' on the 'Swarag Narak' side is similarly sweet; nice and hummable if not especially memorable. I like the tinkling piano. It's the final track that really stands out and the one that sold me on this record. 'Geeta Shlokas & I Love You' is a medley of sorts; what appears to be a lament for a dying person juxtaposed with a steamy slice of Bollywood erotica. It's co-sung by Lata Mangheshkar and the rather enigmatically named Miss Christine, who may in fact be Annette Pinto in disguise. Or at least that's what the IMDb thinks. I'd love it to be the case, but I haven't actually been able to verify it. Does anyone know? Regardless, it's a remarkable piece. Good to see you go at it again PC! 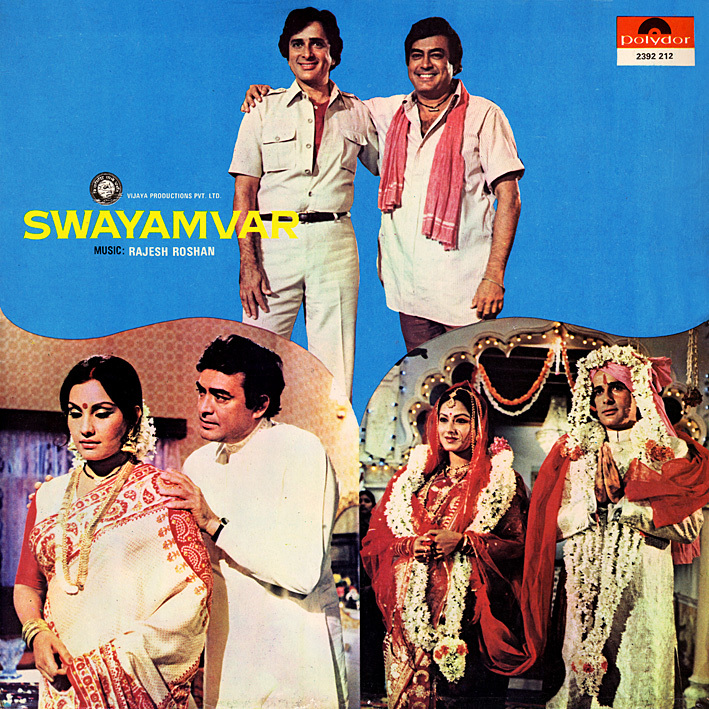 I was actually searching for the CD of Swayamyar/Swarag Narak for quite some time and it seems to be out of stock everywhere. Now it appears I may not need the CD anymore.....thanks a lot for the share ! Thanks PC! I listened to these ... the only other Rajesh Roshan soundtrack that I have really listened to was "Julie". I found Julie to be a great soundtrack, melodic and dreamy. There was an English language song that was quite good to listen to, even though the lyrics were horrible, :-) I have it on Vinyl and CD - the vinyl pressing was from Polydor and a great sounding disc. The CD is okay - but with an annoying hiss so the vinyl would be the first choice for Julie (if you are ever inclined to give it a listen). Julie isn't on top of my want list, but definitely one I'd pick up should a reasonable copy come my way. Some lovely songs on it. FantasticVoyage get JULIE (1975) Vinyl ripped songs here. Do you see similarities in the melody of Mujhe chu rahi hai with Sau saal pehle from Pyar kisi se hota hai? Hadn't considered it...a little maybe. Mujhe choo rahin hain is an amazing song.